After the latest storms we have had in December and January along with the humid nights, conditions have been perfect for Termites annual swarming. Millions of alates (Flying Termites) are released every year on a colonising flight, when the conditions are just perfect after heavy rainfall or a storm. The large cell that swept through Brisbane in December that caused huge damage to buildings across Brisbane Provided the perfect conditions for one of the largest colonising flights in the last 4 years since the 2011 floods with a swarm so large, it was seen from space. 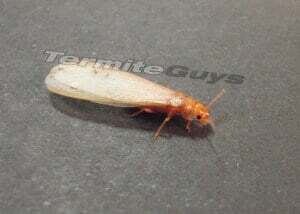 These swarming termites are not a direct threat to your house as they are reproductive termites and don’t necessarily damage timber. However Alates are capable of starting a colony nearby or inside your home if conditions are favourable which could spell damage in the future for your’s and neighbouring properties. 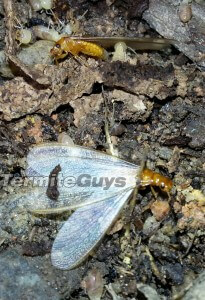 Commonly mistaken for flying ants these winged termites (Alates) are attracted to moisture. You will commonly find them the morning after the flight, stuck to tiles in the kitchen bathroom and wet areas. One of the main concerns inside a house is leaks from showers / roofs / washing machines / basins etc. In normal conditions the majority of flying termites aren’t able to survive in the walls due to the low moisture content in the wall. However if there is a leak the termites can then sustain a colony in and around the wet area such as underneath a leaky shower or bath. If you have found flying termites in the home occasionally after they have dropped there wings (where they look like golden insects on the ground) it doesn’t necessarily mean there is a nest inside your home. However it can still be a sign of a termite infestation or is likely to indicate there is a nest nearby perhaps in your property or on a neighbouring one. One of the best things you can do if you are finding flying termites at night is to turn off some of the lights inside of the home to reduce the attraction as alates are attracted to light. Then perhaps turn the lights on outside to attract them out and spray them with regular bug spray as they are relatively easy to kill. 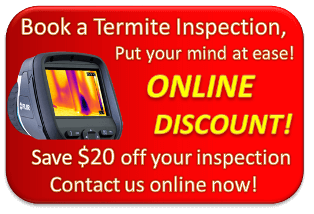 You should also call a termite specialist to do a full inspection of the home with a thermal imagine camera to determine whether there is an infestation inside the home and find any potential leaks which could potentially harbor a nest inside the home. Unsure? 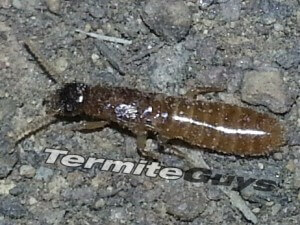 then check that your termite protection is up to date. If you are unsure check your meter box or kitchen cupboard as often a termite technician will place a sticker in there explaining when and what type of protection has been put in place and how long it will last.